Do you recognize this horror icon? Lifelike statue of Forry Ackerman. Honor this highly influential agent, writer, editor, and actor! 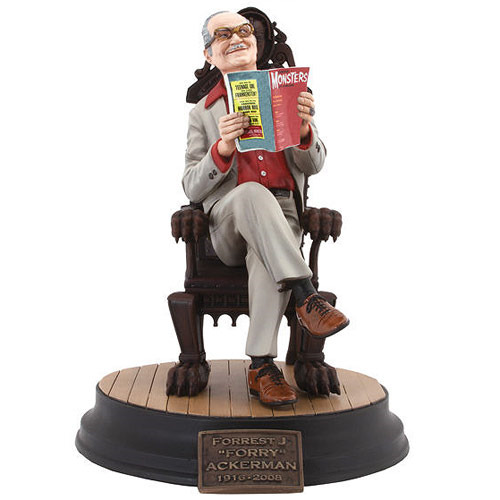 Horror icon Forrest J. Ackerman, commonly known to fans as "Forry," comes to life in this colorful and exceptionally lifelike 13-inch tall statue that includes a nameplate on the base with one of Forry's most popular nicknames, "Dr. Acula." Forrest J. Ackerman was the creator, editor, and principal writer for Famous Monsters of Filmland, a magazine that influenced generations while spreading the love of the horror genre. He was also known for his "Ackermansion," a sprawling house in Los Angeles that held his extensive horror book and memorabilia collection. For 50 years, Forry shared his collection with fans during open-house events. As an agent, writer, editor, and actor, he had far-reaching influence in the science-fiction, horror, and fantasy community. Recommended for ages 18 and up. This is not a toy, keep away from children.